Newly released ebook: “One Stop Macrame Shop” guide features everything there is to know about one of the most popular design trends of the 70’s-macrame. Now its back with with a contemporary twist. Macrame is seeing a huge resurgence as designers like Gucci and Christian Dior have been incorporating it into their fashion lines recently. 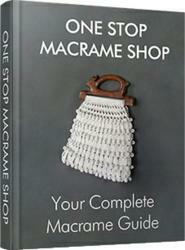 The release of the newly updated Macrame Guide: “One Stop Macrame Shop” comes at an exciting time as the craft gains renewed popularity. In the 70’s macrame was very popular and took the form of plant hangers and owl wall hangings. After that it largely went underground for the past 30 years. Recently though, it’s found its way back to the surface. Macrame is an ancient knot tying craft used to design jewelry, clothing, hammocks and more. While it has been in existence for centuries, it is experiencing a renaissance as top fashion designers such as Gucci and Christian Dior have taken renewed interest, adding macrame to clothing and accessories including bracelets, purses and dresses. The Macrame Lover’s Blog celebrated its one year anniversary recently, and has grown into a vibrant community resource for those looking to improve their skill and connect with others interested in the craft. Over the past year the blog has grown substantially, and offering daily posts for readers to get all the latest information plus patterns, ideas and so much more. It’s currently the only type of blog completely dedicated to the craft. An example of a popular post titled How to Macrame is part of a month long instructional series for beginners. Revealing the #1 mistake people make when following a pattern. How to make projects picture perfect. Secrets to creating beautiful macrame pieces that most pattern books don’t mention. Step-by-step instructions & colorful illustrations. “Eye candy” filled Designer Galleries mean to inspire. For those looking for more information about the craft, our newly revamped ebook “One Stop Macrame Shop” is certain to quench the desire to learn more. The guide is brimming with gorgeous color photos meant to inspire, patterns, knot instructions plus designer secrets and shortcuts.Visit Macrame Lovers today and be prepared to see what everyone is buzzing about.